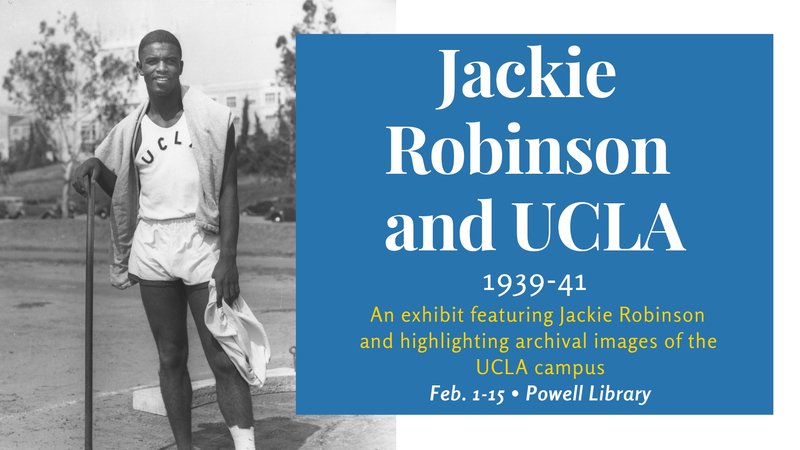 The UCLA Library joins the campus-wide celebration of Jackie Robinson’s 100th birthday by hosting an exhibit highlighting Robinson’s years as a Bruin as well as his deep connection to Westwood. The exhibit is on display from Friday, February 1, to Friday, February 15, in the UCLA Powell Library Main Reading Room (click here for opening hours). “Jackie Robinson and UCLA, 1939–41” features various photographs and ephemera from University Archives, located in UCLA Library Special Collections. One section focuses on Robinson’s time on campus and continued relationship with UCLA during his trailblazing major league baseball career and beyond. The second section reveals aspects of campus life that UCLA students would have experienced during the years Robinson spent in Westwood. Guests visiting campus on Tuesday, February 5, for both the panel discussion on "Athletes, Activism, and Jackie Robinson's Legacy" at 5 p.m. in Schoenberg Hall and the Jackie Robinson 100th Birthday Celebration Concert at 8 p.m. in Royce Hall are encouraged to visit the library between these two events to see the exhibit.